Skycrane is a fleet of helicopters that go around Australia solving the types of problems that only helicopters can solve. When there are fires, Skycrane breaks out the heli’s with the large buckets that can release water on command, and when the wheelchair-bound Albert gets challenged to a race and he accidentally falls off a cliff, Skycrane hoists him to safety. The leader of this high-flying operation is Gus (Markham), an American. His sidekick is the comic-relief Ralph. But their greatest challenge comes when James Price, an evil land developer, and Johnson, a man who loves nothing more than deer poaching, start causing trouble in the Outback. Will these helicopters twirl their way to justice? 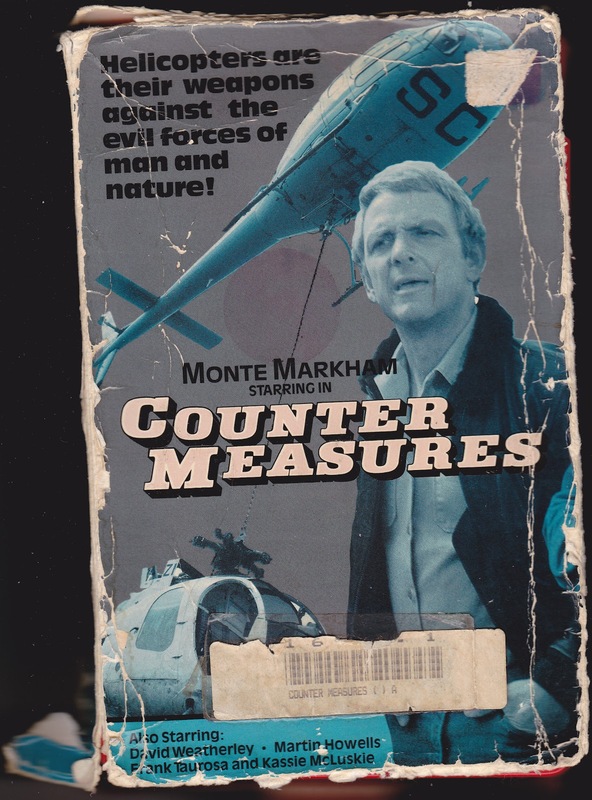 Counter Measures, not to be confused with the Michael Dudikoff outing with the same name, was made for Australian TV in the mid-80’s. Inexplicably, it was released in the U.S. on the great label Paragon, when they were still doing big-boxes and before they converted to their classic style with the movie title on one side of the spine, and some dots on the other. There are even spots for commercial breaks with light-hearted musical stings where you really want to say, “We’ll be right back”. Not much really goes on - Counter Measures isn’t the most pulse-pounding action you ever saw, but it’s charming and certainly not bad. This is almost the type of movie they might play in school in the 80’s on a rainy day. It definitely would help if you’re into helicopters. While everything heli is certainly brought to the forefront, this is a long way from Blue Thunder (1983). But then again, it’s not really supposed to be. It’s everything you’d think a TV movie of this type, from this time and place, would be. It certainly paved the way for such items as Airwolf. 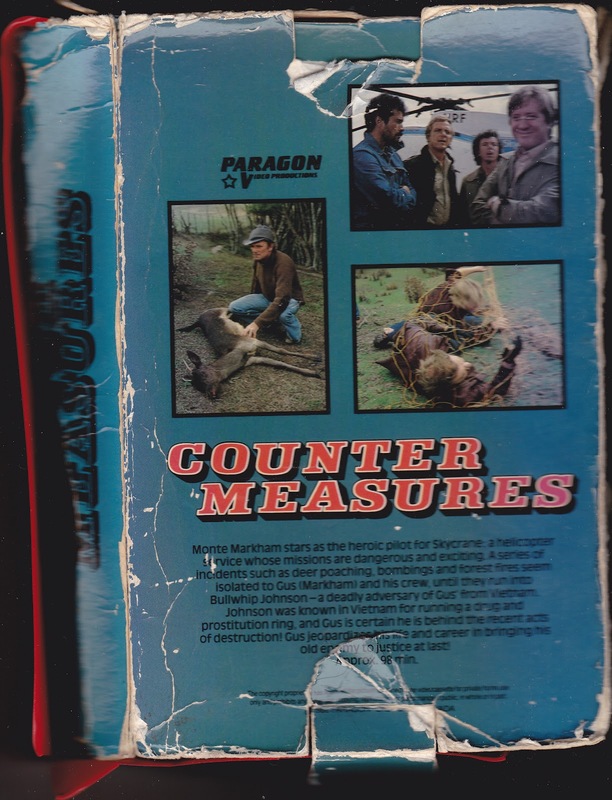 Without Counter Measures, surely there would be no Stringfellow Hawk. As far as the actors, Monte Markham is solid, but the guy who plays James steals the movie. 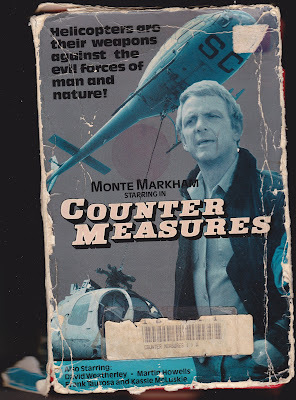 But while Counter Measures is pleasant, if a bit bland and slow, the two best things about the movie are the beautiful Australian locations, and the music by Tony Baker. He puts in a nice synth/keyboard score with an appropriate and memorable theme. It seems to be largely based on fellow Aussies Jigsaw and their song “Sky High”, which makes sense . That song is also the main theme for Brian Trenchard-Smith’s The Man From Hong Kong (1975). 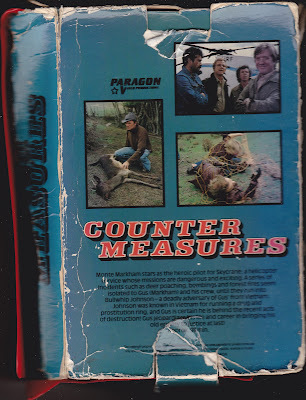 So for a Sunday afternoon time killer with some mild 80’s flair, Counter Measures is an inoffensive way to fit the bill. Austrailia sure has done a lot of interesting films, you should really check out Brian-Trenchard Smith's filmography, especially Escape 2000(AKA Turkey Shoot) and Dead End Drive In. Loved Turkey Shoot! Most of Brian-Trechard Smith's movies from the 70s and 80s are excellent. Especially Stunt Rock and The Man From Hong Kong. Got to love any film where helicopter pilots are the heroes. But tell me, do any of them explode? Unfortunately, there are no helicopter explosions in this. It would have helped the movie a lot if there was at least one.